Rather than facing a vote for removal on the senate floor, Deangela Horton resigned from her position, leaving a vacancy in the College of Education and Health Professions. Due to circumstances which the student government would not comment on, there is also a new vacancy in the College of Engineering and Information Technology. Reed Claiborne, director of the UA Little Rock Disability Resource Center, informed the SGA about the services his department offers to students who have or suspect they might have a disability. President Brian Gregory brought up the idea of a Student Advisory Committee for the Ottenheimer Library. 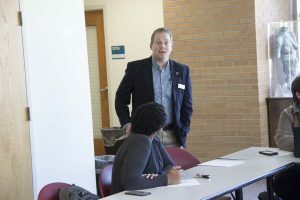 The committee, which would be composed of 8 to 9 students, would advise members of the library staff on what sort of improvements the student government would like to see.